I’ve just released my entry into the Nonoba Multiplayer API Kick Off competition. It’s a multiplayer take on the old memory cards game where you have to turn over pairs of cards and try to remember what was under each one. The multiplayer aspect makes it much more frantic and fun as other players are looking at the same cards at the same time as you and you don’t want them to steal your pairs! 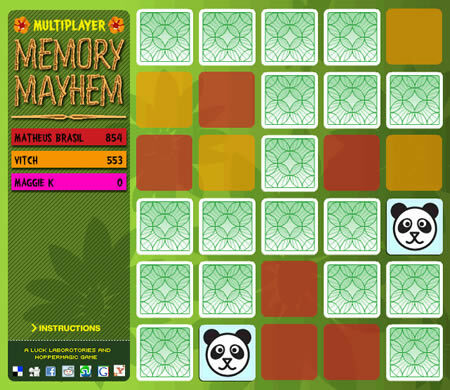 It will probably make more sense if you try it out yourself so go ahead and click the image below to play multiplayer memory mayhem! My good friend Leigh Kayley did the designs (including illustrating all of the cool animals) and I built the game using Papervision, PureMVC, GTween and the Nonoba multiplayer API. 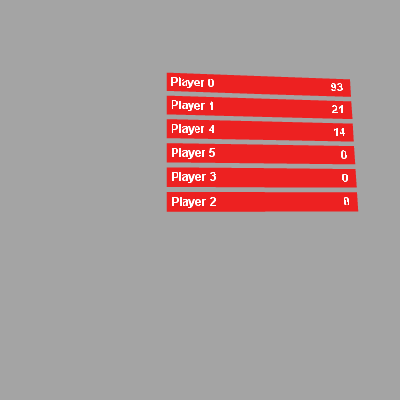 While I was building the game I did a little prototype for the score board transitions using papervision which you can see by clicking the image below. Click anywhere in the movie to give a random player some random points (and so maybe rearrange the scores) and press any keyboard key to toggle some mouse following behaviour. I’m pleased to say that Multiplayer Memory Mayhem won third prize in the multiplayer kickoff competion on Nonoba… Yay! A few months back I heard about a competition being organised by Ico Design, BD4D and the Wellcome Trust. The idea behind this competition was to “produce an interactive Flash piece that is playful and engaging using at least 2 words from the Word Soup”. The “Word Soup” is a collection of words that form part of the branding for the Wellcome Collection. I managed to scrape together a little bit of time so I put together an entry. It was a mashup between the provided words and Flickr. I built it using Flashr and skinned it with a nice clean design knocked up by my good friend Leigh Kayley (based on the look and feel of the scramble game we found on the Wellcome collection’s site). Kelvin Luck asks us to look at images plucked from Flickr and choose from the wordsoup which one was used to tag the picture. It is harder than you think: what word could describe a masked woman in a spangly bikini who is wielding a chainsaw? Clue: it is not what you might think.